I love it when something super simple has a HUGE impact on my life. Or when what feels like a massive problem that might require medical intervention actually turns out to be something that requires an incredibly simple solution. Like the time that I was pretty sure I had skin cancer due to the sudden appearance of a new mole on my face. I was researching my chemotherapy options while trying to figure out how to break the news to my kids when I discovered that it was just some chocolate. When my kids were first starting school, I envisioned our after-school routine to be really simple. They would come home from school. They get off the bus, and they’re angry and hot and hungry. They can barely get in the door, let alone think about homework. Sometimes I can’t even get them off the living room floor. This is not a problem that requires a complex solution! Of course, I immediately approached this issue with full intensity. I researched and talked to friends and family members. I tried out homework stations and created homework charts. I tried sitting with each individual child and doing homework with them. 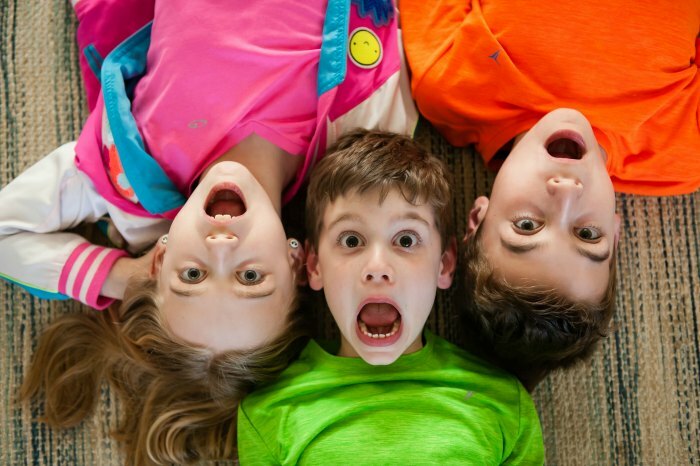 I thought about calling the doctor and emailing the teachers to find out why on earth my kids were so adamant that they were NOT going to do their homework. I even tried setting up a reward system. Yes, if you have kids, I’m sure you’re laughing right about now. Because as it turns out, the solution was much simpler than all of that. Homework boxes are just what they sound like. It’s a box that I have filled with everything the kids might need in order to complete their homework. 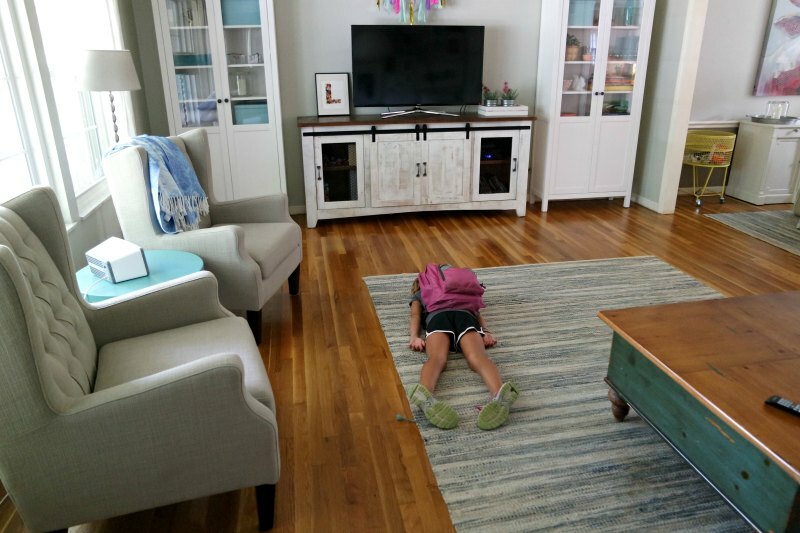 When it’s time to do their homework, (which is part of their after-school routine. See more on that after-school routine here.) they simply grab their homework box and get to work. I know it sounds too simple to actually work (sort of like being able to wash that “cancerous” mole off my face), but it actually makes a HUGE difference. 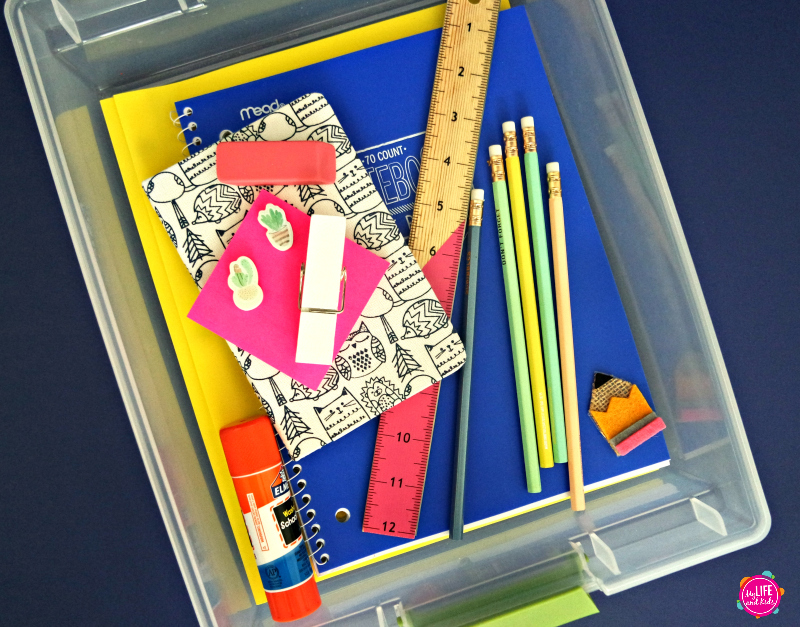 In order to create a homework box, you’ll need a box. 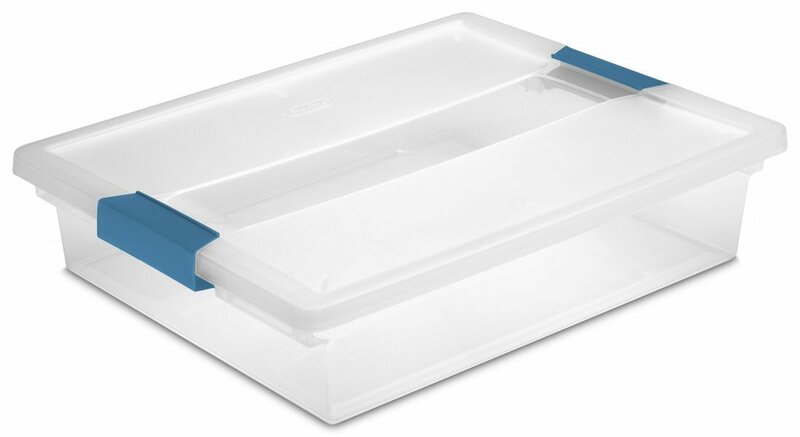 I’ve tried several different options over the years, and I keep going back to a simple plastic box with a lid that locks into place. We’ve had these for two years now, and they’re still going strong. See an example on Amazon here. 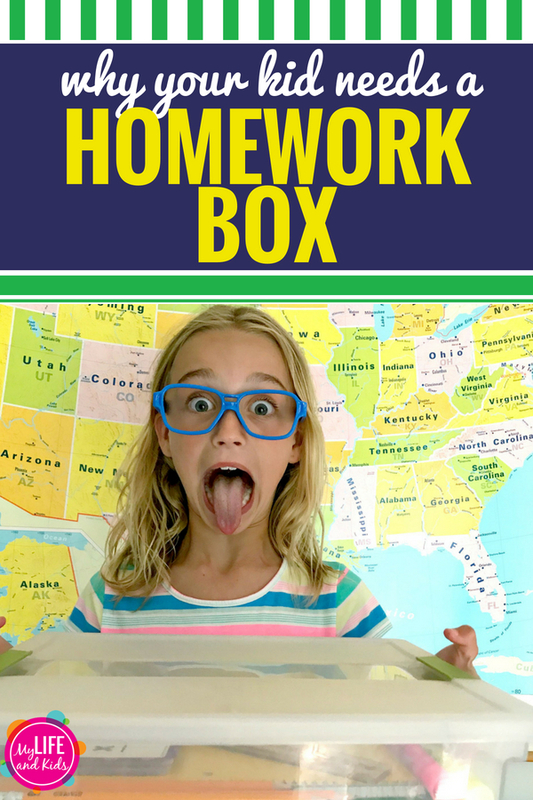 I’ve found that the best way to create a homework box that works is to get my kids involved. I’m so in love with homework boxes, that I even made a little video to show you how to make your own. I know, you think I might be crazy because this all seems pretty simple and how many questions could there possibly be about a homework box? Well, more than you would think actually. So I’m compiling them all here for you. →I have all of these supplies in my house. Why do I need to put them in an “actual” box? I was a total doubter about this and tried a million other things before I went all in on the homework box idea. It just seems too simple to actually work, right? 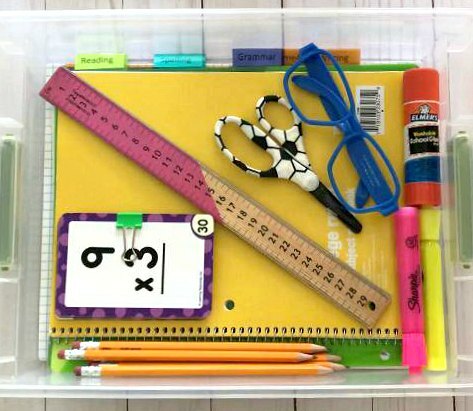 The truth is, having their very own box of supplies that is their designated homework box, helps my kids feel “official.” They have supplies that are part of their routine, and it helps to get them a little more excited about homework. At our house, these supplies ONLY come out when it’s time to do homework. We don’t use the scissors for craft projects or grab the markers anytime we want to color. It’s homework only! →So each kid needs their OWN homework box? Yup. They definitely do. For all of the reasons above. Otherwise you could just keep everything in a cabinet for them to help themselves when they need it. But that would just make way too much sense. 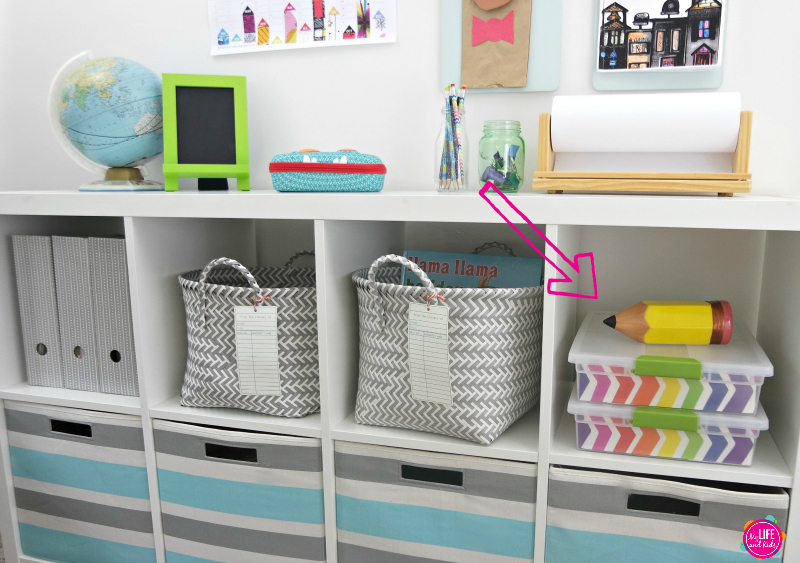 →Where do you keep the homework boxes? Back when I had a lot more room in my house, I had a designated command center that held all of our homework boxes. Now we keep the homework boxes in the hall closet. Although in reality, they usually end up sitting on the kitchen counter or the dining room table during the week so the kids can quickly grab them and get to work. →Did you seriously think you had skin cancer, and it was chocolate? Ahem… It’s not something I’m proud of. Can’t we all just be thankful that it was chocolate?